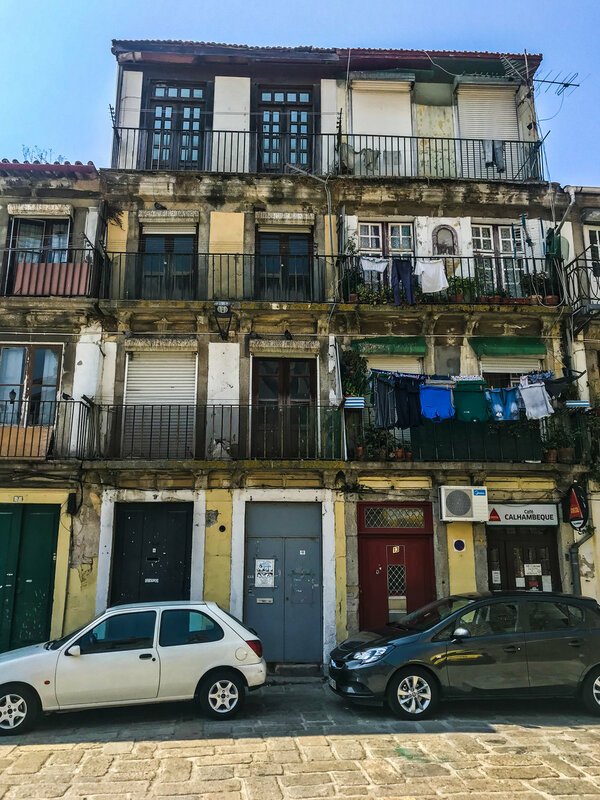 I couldn’t have asked for a sweeter introduction to Portugal than with Porto – and I’m not talking about the port! Porto is a lovely coastal city nestled right by the Atlantic Ocean and bordered by the Douro River. We had flown in from Madrid and in all honesty, as cheap as the budget airlines are, I would’ve much rather have taken the train instead. Ryanair was a complete gongshow, delayed and the commute from the airport to our hotel added another 45-minute commute with the trains coming every 20-minutes. Nevertheless, we had arrived to beautiful, sunny blue skies so really, there wasn’t much to complain about. We had stayed quite a bit of away from the city centre by the Dragao Stadium at the AC Hotel Porto. Definitely not the best hotel unless you are catching a football game (it’s right by the stadium) but once you get to know the train schedule which is only a short 5-minute walk away, it’s a quick 12 – 15 minutes into the city centre. From there, I typically liked to get off at Batalha as everything was within walking distance. Porto is extremely walkable. But like Lisbon, its topography is hilly – so it would be a good idea to wear some comfortable walking shoes. Porto is such a beautiful city that is studded with an old-world charm. I love how well this was preserved. 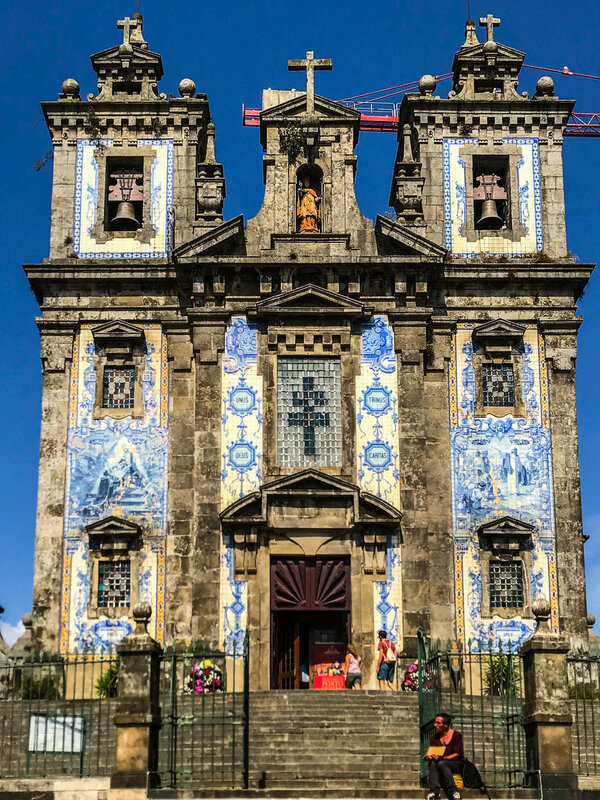 From the churches to the narrow winding alleyways and to all of the cozy restaurants by the riverside, Porto never felt too touristy. For a city of its size, I hardly felt that there were too many people in one given area. It wasn’t ever crowded or overly congested – it was a completely comfortable atmosphere complemented by its wonderful people which made it incredibly easy to explore and enjoy fully in its entirety. The main reason I had pinned Porto on my destination map was that I love port. I am a huge port fan so naturally, I had to make a pit stop here. Although we aren’t directly in the Douro Valley, a number of longtime port wine lodges are housed right in the city. I tried a few including my favourite port wine lodge, Taylor’s, which has been around since 1628. I also had the opportunity to try Calem and Croft. Port tasting, unlike wine tasting, can be very overwhelming due to the high amounts of residual sugar contained in port. It’s very, very sweet and its viscosity is quite thick so I was only able to try and sample a few of the wine lodges and even with that, I think I out-ported myself! If you have the time, be sure to take a tour and try some of ones that are vintage or on reserve – you won’t be disappointed! Besides port, I wasn’t sure what else Porto could offer but boy, was I surprised! 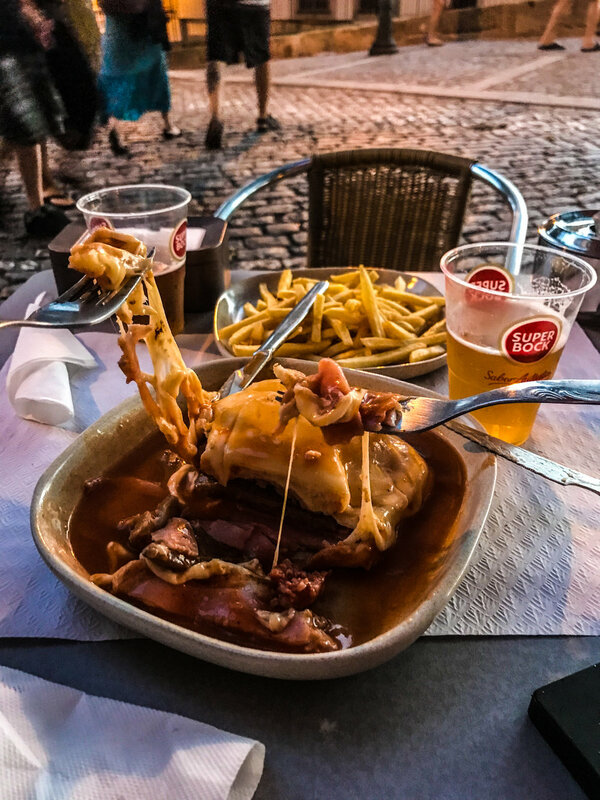 The food was incredibly delicious (it’s the food capital of Portugal), the weather was beyond perfect, and the architecture and buildings were absolutely stunning! I much enjoyed my time in Porto and I’m sure you will fall in the city just as much as I did! 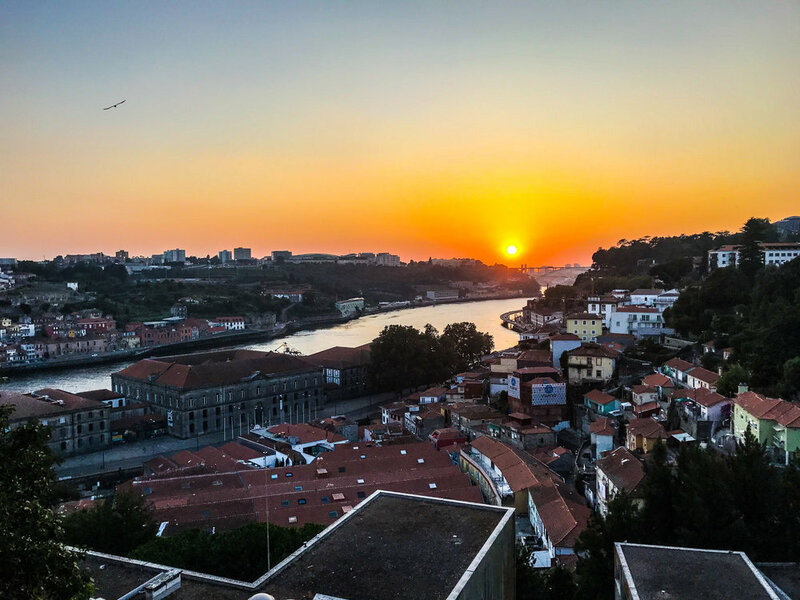 Port Wine Lodges – Obviously, this would be my number one thing to do in Porto! 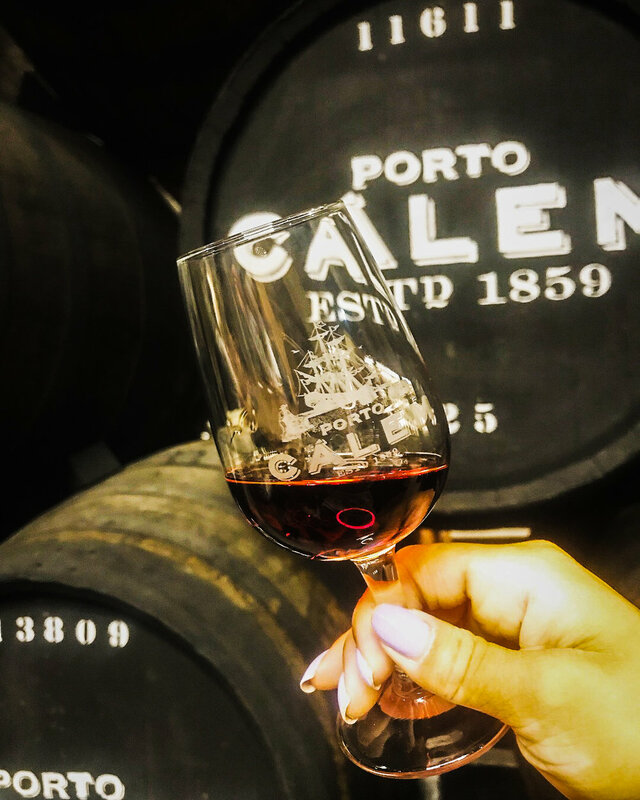 Take a tour or a tasting of some of the world’s famous port wine lodges. Perhaps you’d like a nice caramelized tawny or something new world in the form of pink port – give it a try and don’t be shy. It isn’t to be missed! Douro River – There are numerous restaurants and a small open-air market that are dotted alongside the Douro River. Walk along the short seawall or sit on the water’s edge and people watch. You can see many of the transportation and dinner cruise boats here as well as some very entertaining buskers jumping off the bridge and into the river! Dom Luis I Bridge - The Dom Luis I bridge is particularly outstanding, created by Gustave Eiffel – the same architect who built the Eiffel Tower. The bridge features a lower and higher level for pedestrians to walk on. It can get a little crowded as it is single-lane traffic on each side of the bridge but completely worth it! Livrario Lello – Okay, I’ll admit it I only visited due to this bookstore’s affiliation with J.K. Rowling (she got the idea for Harry Potter while teaching English in Porto). It is definitely a touristy thing and extremely busy. I hate to say that it wasn’t worth it but the bookstore is quite pretty and they even have a section in the back dedicated solely to Harry Potter. Sao Bento – Large and ornate railway station located in the center of Porto. Exceptionally beautiful to photograph, this doesn’t take a lot of time to see and it’s worth a quick pop in and great station to arrive or leave Porto in. Mercado do Bolhau - The new, temporary location of the Bolhau Market sits right next door to Bolhau Station. When I visited, the original location was closed for renovations but had a temporary pop-up in a modern building. It’s a great spot (and cheap!) for lunch. They have wine and food vendors as well as lots of fresh product for groceries - worth checking out if you want to duck out from the sun! Bifana – Thinly-sliced marinated pork in a spicy sauce – this makes for a perfect snack if you’re waiting for the train (as I was). This are seriously addicting – be sure to order two for good measure! Bacalhau – You will find this on every menu or weaved into a lot of different foods in Portugal in general. Bacalhau is salted and dried codfish and can commonly be found in the form of croquettes, fried fritters, or a bras which is folded in with scrambled eggs and potato. It lends a wonderful salty note in most dishes and can be found all over Portugal. Natas – Portguese egg tarts! Not to be confused with Chinese egg tarts, natas are a delight and can be had literally at any time of the day! Creamy, sweetened egg custard with a broiled top, guaranteed to be eating a number of these no matter where you are in Portugal. Tripas a modo do Porto – You all know I’m a sucker for tripe. Tender pieces of honeycomb tripe stewed in a wonderfully hearty mixture of tomatoes and white beans – makes for a great wintertime dish or when you’re feeling like something quintessentially Portuguese. The best one we had was at Restaurant Tripeiro - get it! Pulvo - Porto is located right by the water, so you’d best believe the seafood will be great! Arroz de pulvo is one of my favourite dishes - almost like a runnier and peppery risotto with octopus. I also love it freshly grilled. I had the octopus dish at Cantina 32, a hip Portuguese restaurant right in the thick of it all in Porto. Don’t forget to try their garlic prawns as well! Port - Okay, I might’ve already raved about this already but it’s an absolute must! Go for the tawny, LBV, or the pink port if you’re up to trying something new! Vinho Verde - Green wine? It’s not what you think (darn!). VInho verde is wine from the Verde region of Portugal. It comes from a white grape and I would say it is quite similar to that of a chardonnay. It’s not all about the port in Porto! Coffee - I’m not sure if it was just me, but there was a strong coffee culture in Porto. Actually, now that I think about it, in Lisbon too! Everyone will say to go to Majestic Cafe but be prepared to wait and sit side to side with tourists. We went to Combi instead and the espresso was exquisite - and strong. They also have a food trucks as well in one of the nearby plazas. It seems like I didn’t do a ton of sightseeing or visit any of the museums and that’s true - I didn’t - but I still had the most amazing time. It was one of those cities where I didn’t have to rely on peoples’ recommendations or TripAdvisor (barf) reviews. Porto is truly a place where you can wander, get lost, and have the best time of your life. Tchau!